Here's a cool roulette bet for you. It's called the "snake" or the "red snake". A screenshot to show the chip placement that makes up the "snake bet" in roulette. As you can see, it's called the "snake bet" because when you connect the numbers on the table you've bet on, it forms an "S" snake shape. It's also sometimes referred to as the "red snake" as the bet only covers red numbers. The snake is made up of 12 straight (single number) bets. There are no split bets on any numbers along the snake. 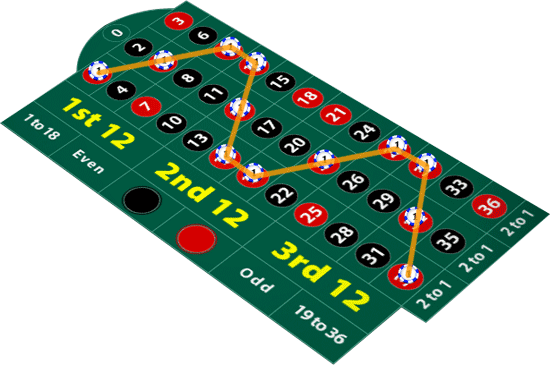 It's also normal for each bet to be of the same unit, so players do not bet more on one number of the snake than another. For example, you would place $1 on each straight bet, rather than $2 on one and $5 on another (and so on). A screenshot of me using the custom betting feature at Unibet to save the "snake bet" layout. 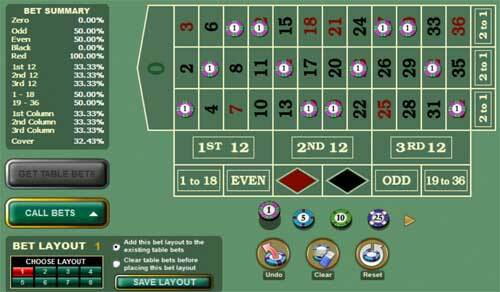 There are no online roulette casinos that I know of that offer a specific "snake bet" button or option. However, there's nothing stopping you from placing your chips manually to recreate the snake bet format – you can do this at any online roulette table. Having said that, manually placing 12 chips to build the snake may get a little tedious. So a clever idea would be to play at a casino that offers a custom betting option, where you can create a betting layout and save it for quick and easy future use. The snake bet in B&M casinos. The snake is a perfectly legal bet, so there's no reason why you can't place at your local casino. Of course, more often than not you'll have to create the bet yourself, as there probably isn't going to be the option to place this bet quickly and easily like you can on a "red" or "evens" bet. There are some casinos out there though that openly allow players to place a snake bet by placing a chip on the corner of 34 red (the number at the end of the snake). However, this option is a rarity and the protocol for making/announcing the bet will vary from one establishment to another, if of course it is in effect in the first place. Where did the snake bet come from? I don't know, but I imagine you could find plenty of casinos and bettors all over the world claiming to be the originator of the snake bet. You don't have to be too gifted to notice that there is a zigzag pattern of red numbers starting with the number 1 and ending at the number 34. I'd assume the bet had been placed in many different casinos before it became widely and more commonly known as the snake or red snake. So it's not like you can assign this bet to one casino or nation like you can with the French call bets. It is popular amongst Chinese bettors though. The colour red in Chinese culture symbolises fortune and joy. The snake is a Chinese zodiac animal. So the "Year of the Snake" will come around every 12 years. Mix these two together and you've got a very attractive name for a roulette bet in Chinese culture. Are there any pros or cons to making this bet? In other words, is the snake bet lucky? Or in more specific words, does the red snake bet have a higher probability of winning or provide a more attractive house edge? You have the same probability of winning with the snake bet as you would with any 12 randomly placed straight bets. In terms of probability of hitting, there's no difference between placing 12 units across a snake bet than there is to placing 12 units on a "dozen" or "column" bet. The house edge also remains the same at 2.70% (or 5.26% if you're playing double-zero roulette). Pro: Potentially a more enjoyable and exciting bet to place. Con: Takes a while to set up. Con: Requires a large number of betting units, which will be costly if you don't have a large bankroll. If you like the look of the bet then by all means go for it. Roulette is all about having fun, so bet in whatever pattern or shape you like. The snake just happens to look pretty cool.